Braised Savoy Cabbage with Prosciutto, Thyme for Cooking quick sides. 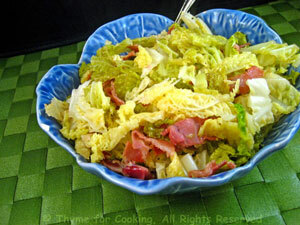 This is an Italian-influenced dish - both the 'green' cabbage and Prosciutto (for flavor), being common. Heat olive oil in a large skillet. Add Prosciutto and sauté briefly. Add cabbage and sauté until starting to wilt. Add wine, cover and braise over low heat for 20 minutes, stirring occasionally.